I spent some time in the mountains today. We drove from our home in Bend about 30 miles to an area called Metolius. 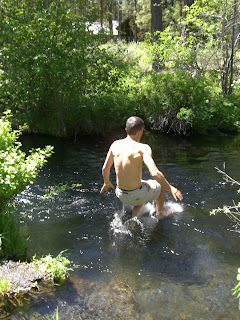 This river just appears out of nowhere from a spring that originates deep in the cascades. We visited last weekend and went for a swim...the water was freezing. Anyhow, we went back up this weekend with some friends and just enjoyed sitting around the fire swapping stories and talking. This morning between conversations ranging from politics to religion to the fact that our dog hadn't used the bathroom for 2 days, i found some time to get some reading in. Two things I'll throw out. First, the posture of my heart needs constant correction. On page 89, Eldredge writes " I want two things in my lif that are mutally opposed--I want to live a nice little life, and I want to play an important role in God's kingdom. And it's in those times that I am trying to live a nice little life that I make decision and choices that cause me in small and subtle ways to live out side of Jesus." That thought has arrested me today. Because I can totally relate. I am so often busy creating my nice little life that I lose complete touch with Jesus. Which brings me to the second thing. I don't pray enough. I want the posture of my heart to be one that needs and desires to get God's input on everything. After all, He is GOD. Why don't I take the time to just ask him what he wants, what he'd like for me to do, where he'd like for me to spend my time in a given day...all these things show the posture of my heart. I like that expression. Because for me, I know exactly what the posture of my heart is from moment to moment and I know when it is open to God's shepherding and the Spirit's leading in my life and when I'm shut off and am not even thinking about listening. I'm going to work on this through this next week.